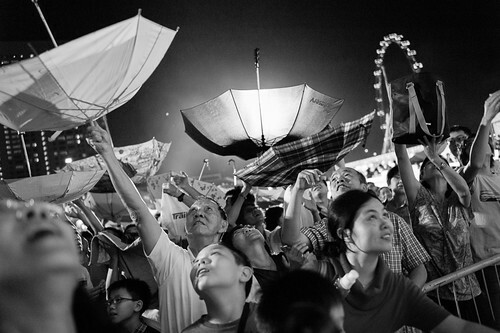 With cries of “Huat ah!” (Chinese Hokkien dialect for prospser) believers in the god of fortune raised inverted umbrellas and looked skywards as they hope to catch a few of the gold dust signifying good fortune for the year. Every year at River Hongbao by Marina Bay (and in more recent years, at The Float @ Marina Bay), the annual Chinese New Year festival extravaganza, there will always be a giant Chinese god of fortune installed amidst the rest of the Chinese history, folklore and legend inspired installations. 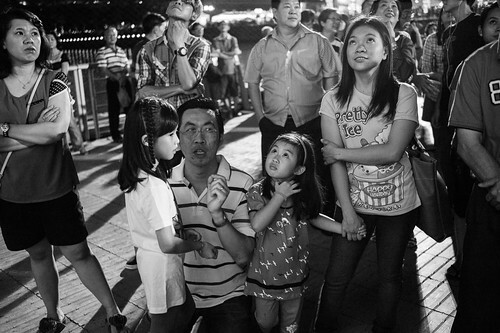 Chinese are great believers in good fortune and prosperity. 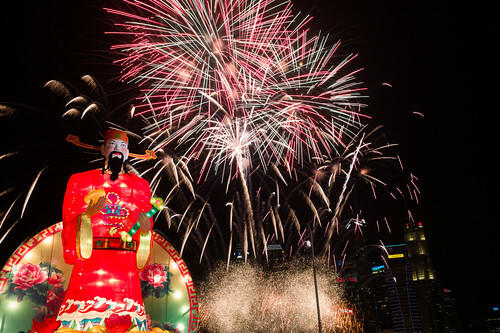 The common cry of “Huat ah” (to prosper) graces chinese homes across the country during chinese new year season. 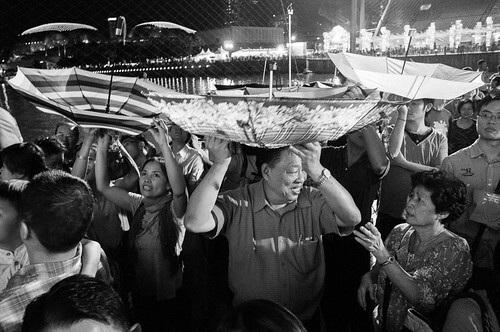 No where is this more evident than the crowds pushing their way under the god of fortune at River Hongbao hoping for a sprinkle of gold dust and good fortune. Gold dust spewed forth by the statue signifies good fortune and prosperous times if you can catch some! A man teaching his 2 daughters about chinese culture and traditions pertaining to the god of fortune and the significance of the gold dust sprinkles. 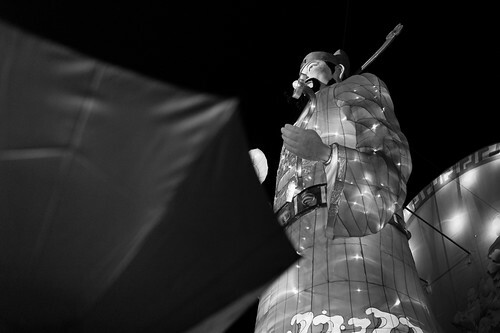 Among the zodiac lanterns and other giant light installations, the god of fortune towers impressively over the rest of the other structures, giving prominence to the ideals and the hopes of people to prosper financially. 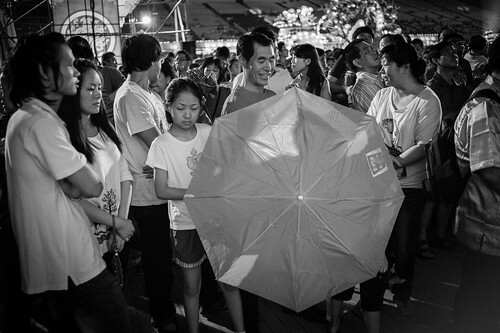 Opening a giant umbrella, this man is ready for his harvest. An umbrella was raised for the possibility of another gold dust sprinkle after the initial salvo. The pensive look of this woman says it all – if there’s good fortune in the gold dust, then it’s worth a shot at catching them. Fortune and prosperity are universal human desires. 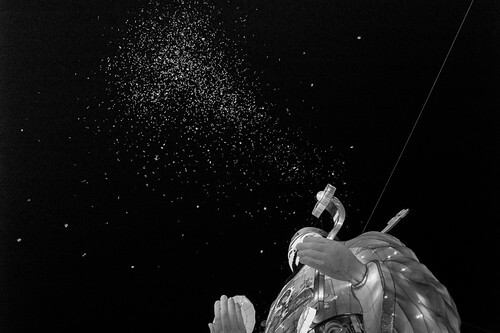 Every year, at certain times of the festival, the massive structure will spew forth “gold dust” and lucky numbers for adherents of the faith to catch, in the hopes of landing good fortune, and perhaps a lucky number of so to win the local lottery. 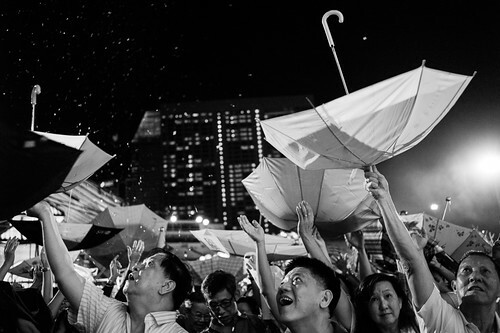 It’s a spectacle of its own, with everyone from young to old looking skywards towards heaven, with umbrellas, open bags, clasped hands forming containers aiming to capture as much of the specks of gold glitter as they could. 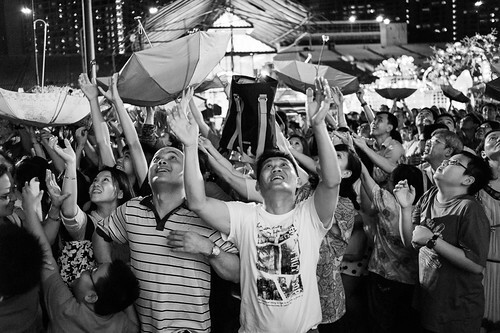 Feeding frenzy – crowds shout and surge towards the scattering of gold dust from the god of fortune. Whether young or old, fortune favors those who are lucky enough to catch dusts of gold spewed forth from the statue, according to ancient Chinese traditions and beliefs. 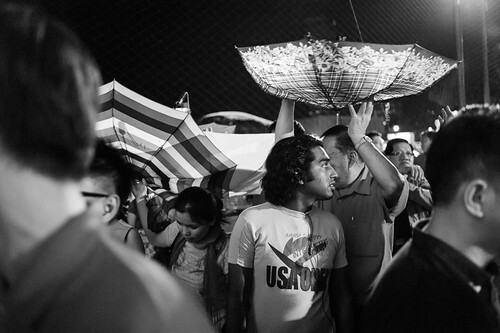 Inverted umbrellas form good catchment areas for gold dust from the statue. I was crushed in the crowd last night as I waded into the middle of the feeding frenzy – that was the first year I felt my safety was threatened by the hordes of fortune hunters, and I had to hold onto my camera tightly while trying to navigate the crowds and take pictures at the same time. 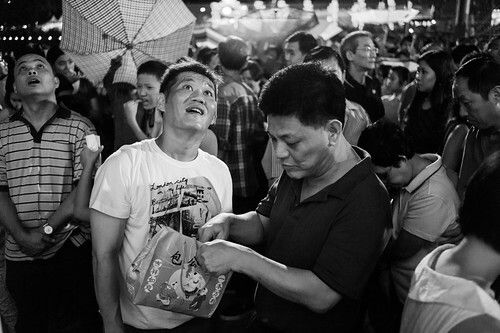 A man checking his loot while his friend looks skywards for glimpses of additional gold dust from heaven. Wishing for fortune is not limited by race of language or religion – it’s a universal inner desire. 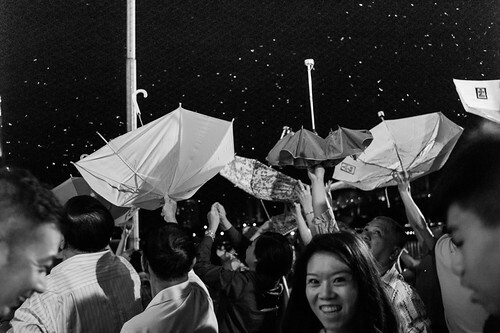 Crowds come prepared with umbrellas ready to catch just that bit of good fortune. This was the only photo I picked from this set shot with a Ricoh GXR. 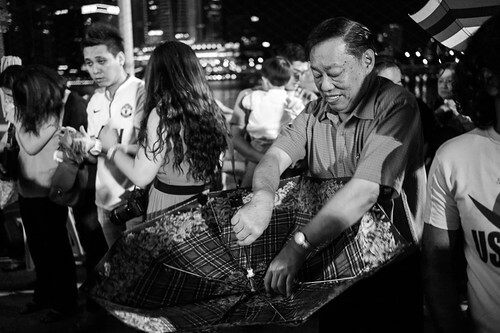 A man digs into his umbrella for any spinkle of gold dust, and good fortune, that may have landed inside. What do these people want to find among golden colored pieces of paper? 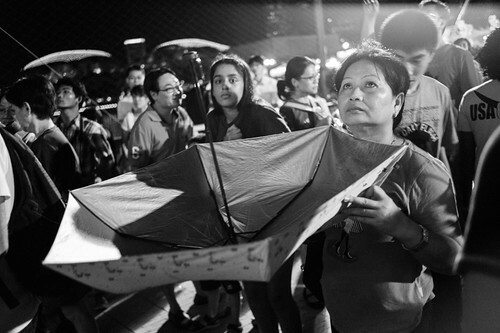 The answer I believe, is a certain hope, a hope that in the lunar new year of 2013, perhaps the good fortune that had proven so elusive for some of them, would finally find its way into their lives. Photos all shot with a Leica M9 and a single 35mm Summarit f2.5mm lens except for 1 photo with a Ricoh GXR with the A12 28mm f2.5 module.